The clavicle is the only bony strut connecting the arm to the body. Clavicle (collar-bone) fractures can occur from a blow or fall onto the point of the shoulder as the impact overloads this bony strut. Falling from your bike, or being tackled and landing on the tip of your shoulder is a common mechanism for clavicle fractures that we see in the clinic. Most the fractures occur in the middle of the clavicle (called mid-shaft fractures). However, it is possible to have fractures at either end of the collarbone. Midshaft clavicular fractures can cause displacement of the clavicle. 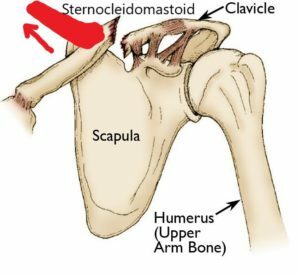 This is because of the pull of the muscles (sternocleidomastoid) attached to the inside of the clavicle is no longer held down by the ligaments at the end of the clavicle. This results in the bone being pulled upwards (called tenting). This is disagreement in the literature about whether it is better to have these fractures surgically fixed, as many people with this type of fracture achieve very good function from non-operative treatment. If you would like more individual advice regarding your clavicle fracture, please call the clinic to make an appointment on 093666457, or book online by clicking here.